Can you believe we have only 5 more sleeps to Christmas, I am actually quite looking forward to it, well not the insane part of having the family hustle and bustle about my house, Milo being chased, me crying over monopoly as I'm sure I must be up more money and houses and someone's in cahoots with the banker, dad in the corner laughing at me whilst drunk, my step mum smoking in the garden and calling my dad Tony when his actual name is Donald! A million of my brothers and sisters running around and kids jumping off every high surface they could find! Ohh I actually love Christmas, hurry up family and come on down! What better way to get in to the festive spirit than with these yummy Gingerbread Men and Reindeer biscuits, now if you follow me on Instagram you would of seen on my Instastories that I cocked up the first batch! So I was pleased as punch as to when the second came out brilliantly, well except for on that I had placed to close together and it looked like it was about to punch one in the head! That one can be for Milo! I have to say, they are really quick to whip up as long as you've prepped, I did mine all in a short space of time, after nursery drop off, quick pop to the nail shop, then whipped up these bad boys or should I say men and reindeers and I was in the office all by 1pm. Not a bad Monday morning if I do say so myself toot toot! (Show off-lol) well enough of the shameful boasting let's whip up a batch to make. Sift together the flour, bicarbonate of soda, pumpkin spice mix and pour into a food processor. Add the butter and blend until the mix looks like breadcrumbs. Pour in the sugar. Lightly beat the egg and maple syrup together, add to the food processor and pulse until the mixture clumps together. Tip the dough out, knead until smooth, wrap in clingfim and leave to chill in the fridge for 15 minutes. Roll the dough on a lightly floured surface. Using cutters, cut out the gingerbread men and reindeer (same as the men) shapes and place on the baking tray, leaving a gap between them. Bake for 12-15 minutes, or until lightly golden-brown. Leave on the tray for 10 minutes and then move to a wire rack to finish cooling. When cooled decorate with the icing. 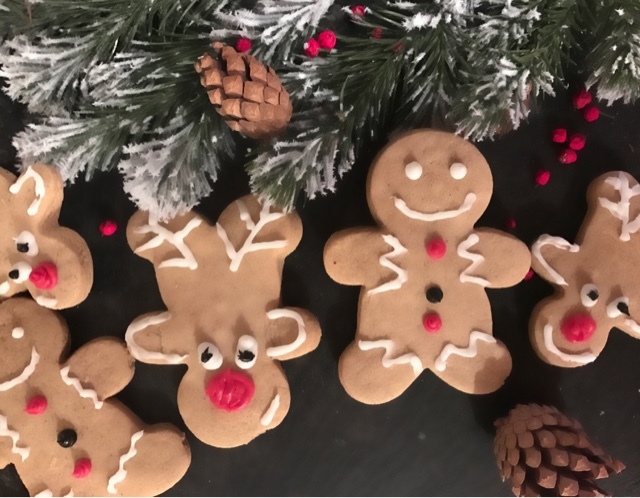 This easy recipe for gingerbread men and reindeer biscuits are great for baking with children, and it makes a lovely homemade Christmas present or whilst the whole family is sitting down and watching their favourite Christmas movie or the Queens speech. If you whip up a batch or have great recipes you make with the family or especially for the Christmas period let me know, in the comments below! Don't forget to tag me on Twitter if you make them up @lindseylondonmumma or tweet me a picture over on Twitter.